Any tea that is sold in bulk bins at Safeway or online from Walmart has me skeptical from the start … but two facts motivated me to at least give Tiesta Tea a try. 1: The creators are from Chicago. 2: They came up with the idea while visiting a Czech tea house in Prague. It took 15 years from launch date but their product is now sold in over 7k stores nationwide. The concept continues to be a simple one: provide quality loose leaf tea at affordable prices. I agree with the affordable part. The cost of loose leaf tea has skyrocketed making the profit margin even greater than coffee beans. As soon as it became trendy, marketing sharks became tea gurus and took drinkers for a ride. The last 20 yrs has seen prices spiraling out of control. I give Tiesta credit for putting the lid back on costs and adding a spirit of fun along the way. Their colorful packaging, funky blends and creative website definitely caters to a young audience with less sophisticated palates but no harm in that. I applaud their honest endeavors and their slogan: drink loose, live loose. 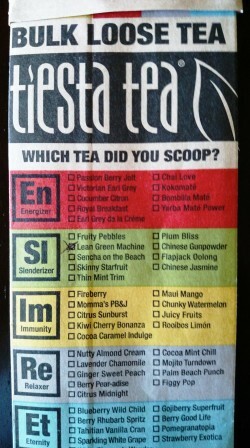 Extra points: Tiesta teas are blended in Germany and held to higher quality controls. SipTip: If you don’t want to stray too far off the traditional path, start with Lean Green Machine – a bright blend of green teas, lemon grass and bergamot. And no artificial flavoring.